Day 1 of Comic-Con was everything you’d expect. Crowds, cosplay, and curveballs galore. Thursday’s Hall H presentations began a bit later than they will the rest of the weekend, but the movie surprises were rapid-fire with plenty of juicy tidbits to make each of the presentations quite exciting. The day was fun-filled enough that not even the cancellation of the Goonies Never Say Die panel could ruin it. Here’s a recap of the day, and be sure to follow us on Facebook, Twitter, and Instagram for details as they come throughout the day, @WayTooIndie. While not initially on our most anticipated list of Comic-Con, the first panel of the day ended up being rather delightful. Moderated by Craig Ferguson, who started with especially funny jabs at Jeffrey Katzenberg and his own inability to land coveted voice-acting gigs, he welcomed in Tim Johnson and Jim Parsons of the new animated feature Home. Johnson directs this fun little alien film around a quirky, minion-like alien society that colonize Earth. Among these aliens is Oh (Parsons), whose outsider tendencies make him a pariah among his people. When he meets Tip (Rihanna), an unlikely friendship emerges and the two have to work together to save earth. Dreamworks gave us plenty of footage, including a long action sequence that shows off some of the film’s animation. It doesn’t look especially enlightened, and is even slightly reminiscent of Monsters vs. Aliens, which wasn’t exceptional. Home should be coming out in March. A title card was presented for B.O.O. : Bureau of Otherworldly Operations, an animated film about a ghost sent back to haunting school voiced by Seth Rogan with Melissa McCarthy and Bill Murray. Should be out next summer. The real fun began when they finally moved on to the Penguins of Madagascar, which will be released this November. A definite oddity in the world of both animation and sequels, especially animated sequels, the Madagascar series has only grown in its cleverness and acclaim with Madagascar 3: Europe’s Most Wanted scoring higher than the earlier two on Rotten Tomatoes. Now this spinoff, which already has its own TV series, gets its own feature film. 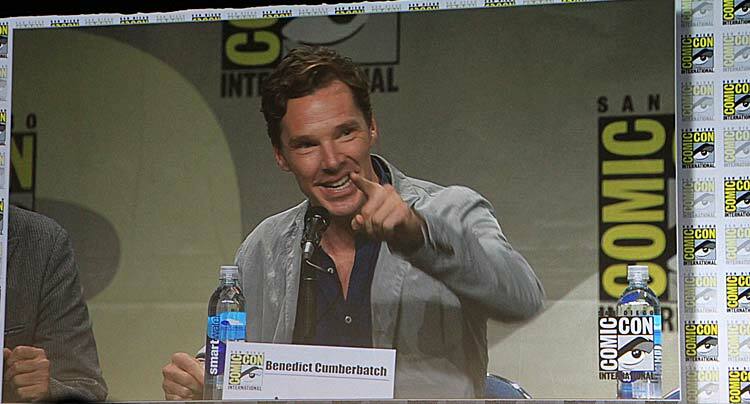 What began as A LOT of footage and a conversation with directors Simon J. Smith and Eric Darnell, and voice actor Tom McGrath, quickly escalated as the panel welcomed first John Malkovich, who plays evil octopus villain Dave, and then soon after, the one and only Benedict Cumberbatch who plays Classified, a Bond-like wolf. 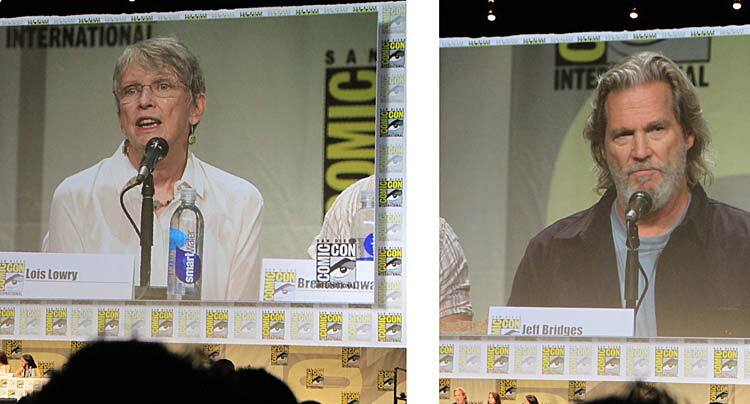 Of course fans were hard pressed to keep their questions limited to the movie at hand, Ferguson joking that “Any questions about Sherlock and Comic-Con is cancelled”, but a clever fan was able to pose a question to Malkovich and Cumberbatch about what super hero they would most like to play. Malkovich gave a very Malkovichian answer and replied after some thought, “Lois Lane”, Cumberbatch was clearly being goaded for info on his talks to play Doctor Strange, and while he hemmed and hawed initially he did make a non-commital Doctor Strange comment before saying “I don’t know, Batman” which alludes that conversations are definitely ongoing. We’ll see if we see him at Marvel’s panel Saturday. Up next was a straightforward panel about The Weinstein Company’s upcoming film The Giver. Lois Lowry, author of the now 21-year-old young adult novel, was on hand and sharper than any of the younger panelists. Her wicked wit and astute observations providing plenty of explanation for her inciting and thoughtful dystopian drama. An extended trailer (showing what felt practically like the entire film) was revealed and it looks not only true to the adaptation, but like an exceptionally well done film. Director Phillip Noyce couldn’t be at the panel, but sent a filmed intro explaining his passion for the project. But none spoke more passionately than Jeff Bridges, who plays The Giver, the one who enlightens the young protagonist to the evil and suppression of their supposedly perfect society. Bridges has been lobbying to get the film made for years, initially hoping to direct it himself and cast his father in the role of The Giver. He’s not the only one who seems to have grown into his role for the film. Lowry admitted she had hoped the script would allow for one of the more controversial scenes of the book, when teenage Jonas bathes an elderly woman, so that she herself might play the woman. Sadly the film didn’t make it into the script. Lowry also praised the missing Meryl Streep’s performance (and from the extended trailer it does look quite impressive), she even went so far as to say seeing Streep’s performance made her want to go back and “rewrite the character to be more like her portrayal.” High praise indeed from such an acclaimed writer. Pretty much everything we expected. A brief video from director Chris Columbus promoting his film Pixels and a gag video of sorts. Mostly they want fans to participate in their live experience at the Hard Rock Hotel, which includes an arcade. It fits, as the film, which stars Adam Sandler and Peter Dinklage is about aliens who attack earth when they think our old arcade style video games are an actual attempt at intergalactic warfare. The majority of the panel was about the upcoming Goosebumps film, introduced with a video featuring writer R.L. Stine. Mostly Jack Black, who plays Stine in the film, was on hand to be goofy, present clips, and banter with Slappy the Dummy, one of the scarier and more memorable of Stine’s evil characters. Slappy was shortly joined by a bevy of other Stine-imagined monsters and eventually they all drag Black off stage. Our nostalgia is adequately piqued. Rounding out the day was the panel we were less sure of and that most definitely packed the biggest punch. They were always going to push Teenage Mutant Ninja Turtles on us, and they did, almost immediately following a sneak peek at the trailer for the new SpongeBob Square Pants film, The SpongeBob Movie: Sponge Out of Water. Then a bass-thumping intro for TMNT came on, exploring the evolution of the Turtles as told by co-creator Kevin Eastman and ending with footage from the film, marking this new rendition/era of the Turtles. It adequately raised expectations in the room and hearing Eastman discuss the Turtles and his excitement for the film along with director Jonathan Liebseman and eventually co-stars of the film Megan Fox and Will Arnett had even this skeptic thinking this film may not be so bad. Then they showed us a solid ten minute clip of an action sequence down a snow-covered mountain in a semi-truck. And it was ridiculous, but the good news is that despite all the spectacle, the Turtles themselves are quite funny and the film should be entertaining. An especially interesting moment was when a fan turned interrogative and asked Eastman why there were implications in the trailer that the Turtles are aliens. Eastman recovered well saying they had always intended that the ‘ooze’ from whence the Turtles comes is an alien substance. Those unwilling to see the franchise stray from its roots may have a hard time swallowing that. TMNT was plowed through rather fast and then we got a quick look at Dean Israelite’s new Michael Bay produced Project Almanac film. It looks a little too shaky footage-y for my liking, but interested fans were given the chance to attend a preview Thursday evening on a first come, first served basis. 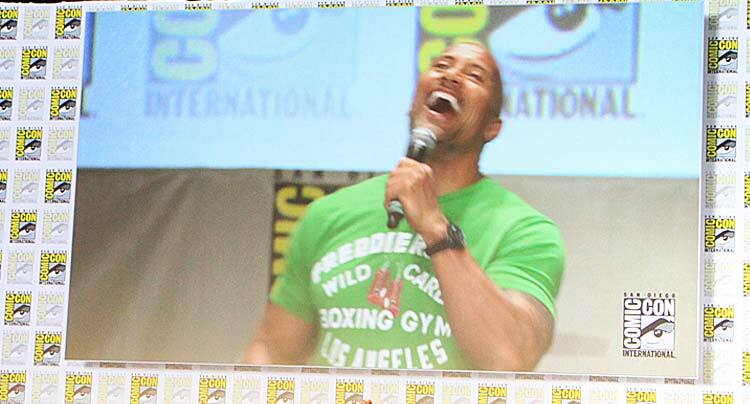 And speaking of sneak previews, next up was an especially fun visit from Dwayne Johnson, who walked out into the crowd and then on to the stage to encourage Comic-Con-ers to check out his film Hercules, opening Friday. And as a special promotion, The Rock rented out three Gaslamp area theaters for the audience to show up to (at a time of his tweeting) for a special advanced screening. The Rock seemed like a high note to end on, but the hits just kept on coming and out walks Clark Duke with two hot chicks on his arms. I didn’t think they’d talk about it, nor did I think I wanted to hear about it, but there it was: Hot Tub Time Machine 2 (watch the newly released trailer). While obviously lacking in the first film’s leading man, John Cusack, the film, which has the guys traveling into the future, looks surprisingly hilarious for a sequel, not to mention a film about time travel via jacuzzi. That would have pretty much ended things nicely, except this is Comic-Con, and the name of the game is shock and awe. When the recognizable footage from the Interstellar trailer starts to play the crowd goes nuts. 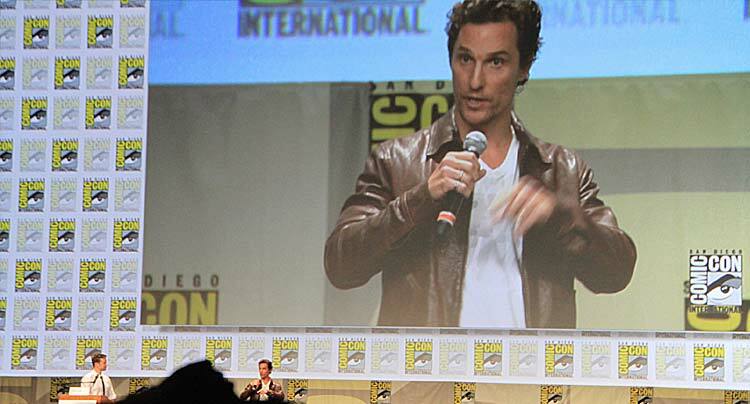 And when the trailer ends and Matthew McConaughey is brought onto the stage for his first ever appearance at the con, the audience is on its feet. McConaughey gives us a few ‘alright’s, to satisfy the crowd, and then starts giving us vague insight into Christopher Nolan‘s mysterious new film. Sure it’s about space travel. Sure it’s about a family man who has to make a hard choice. McConaughey finally starts getting into it describing Nolan as a director who needs to be original and who “works by his instincts.” McConaughey describes the filmmaking process with Nolan, that it “felt like an independent film — 2, 3 takes and we’d move on.” He claims this is his most ambitious film to date, and then decides he’s not sure he can really tell anymore, so perhaps he should let the man speak for himself. And out comes Nolan, also a Comic-Con first-timer. Finally, a real conversation around the film and then what we’re all waiting for: an honest to goodness trailer that gives us an idea about what happens in this film. The trailer won’t be up for a while, but I can say it certainly gets into more detail about the space travel aspect of the film. There’s more Anne Hathaway. More Michael Caine. A little Wes Bentley and Jessica Chastain. And we can finally see that the film seems to focus on astronauts (space travelers? pilots?) who travel to space to find some place else where Earth’s inhabitants can survive. McConaughey’s Cooper is a conflicted man, at odds against his love for his own family and his desire to contribute to the greater good. There are some impressive space shots of fictional galaxies and the planet they seem to want to try and make habitable. It’s got the same vagueness Inception’s trailer had, which only makes us want to see it more. All in all an exhausting but eventful first day. Stay tuned, we’ll be here all weekend!